If there’s one thing we’re learning about this global planetary experiment called climate change, it’s that there are unexpected consequences. Case in point: All of the water pouring off Earth’s melting ice sheets is making the oceans heavier, so much so that seafloors are literally sinking. And that could be messing with our measurements of global sea level rise. Just as standing atop a trampoline causes it to sag, packing extra weight on our round Earth causes the Earth to become squished. Scientists have known this for a long time. 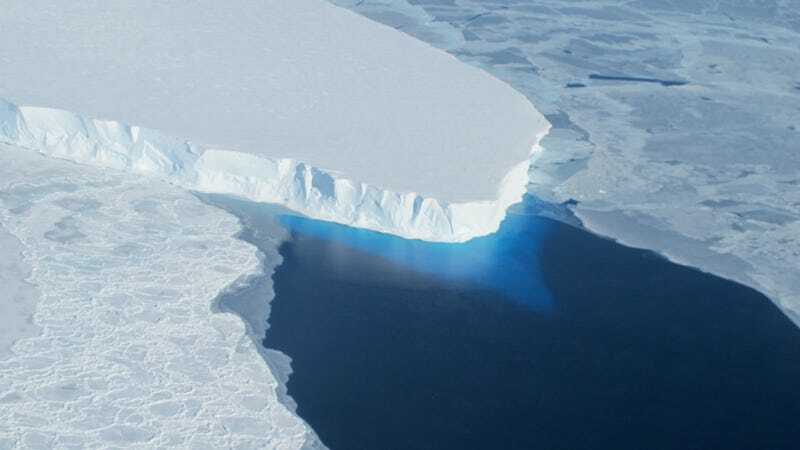 But a team of researchers wanted to find out exactly how much the seafloor is getting squished by all the extra water associated with melting ice sheets and human-driven changes to land water storage. Turns out, the squishing effect is big enough that our satellite altimeters—which measure the height of the ocean surface relative to the center of the Earth, but don’t notice what’s happening at the seafloor—may be underestimating global sea level rise. This is small potatoes for coastal dwellers (at least for now), but can lead to real measurement discrepancies for scientists. To find out, the researchers did a lot of math. They plugged recent model estimates and data on mass loss from the Greenland and Antarctica ice sheets, and changes in water storage on land surfaces (due to dams, irrigation, and more), into equations that can spit out relative ( à la tide gauge) and absolute ( à la satellite) sea level estimates for different locations on Earth. They found that the increased total ocean load from these largely human-driven changes caused the ocean floor to sink, on average, by about 0.1 mm/year between 1993-2014, or 2.1 mm over the entire period. That may not sound like much, especially when you consider sea levels have risen roughly 80 mm since the early ‘90s, but let me remind you that we’re talking about the entire goddamn ocean getting pressed down. Plus, when you add all those little changes up, the authors find that our satellites are underestimating the amount sea levels have risen due to added ocean water by about eight percent. All in all, this has the effect of throwing off satellite sea level estimates by just four percent, because roughly half of sea level rise comes from added water, and half from rising temperatures causing water to expand in place. There were some interesting spatial trends, too. In regions where most of the ice is melting—Greenland and the Arctic ocean—the seafloor is actually uplifting slightly as weight is taken off. In fact, since most of the disappearing ice is concentrated in the global north, pretty much the entire northern hemisphere is seeing a slight seafloor uplift effect, while subsidence is concentrated in the south, particularly the Southern Ocean. Understanding these regional changes is important for reconciling relative sea level measurements taken at specific locations with measurements taken from satellites. Frederikse hopes that scientists will start taking the effect into account to improve their book-keeping. For the average reader, though, there’s an even simpler takeaway, which is that humans are messing with the planet in some very profound ways.